Chinese design practice AFSO have created a panoply of interior spaces at the St Regis, Hong Kong, a recently opened resort that has been likened to a "curated mansion". Located in the city's Wan Chai district, the 27-storey flagship – the first venue from the St. Regis Hotels and Resorts hospiality group to debut in Hong Kong – features 129 guest rooms and suites as well as a pool, bar, tea room, terrace, and a health club with spa and gym amenities. On-site dining outlets include the L'Envol, a French eatery; and Rùn, a restaurant specialising in Cantonese cuisine. AFSO's design pays homage both to St. Regis's luxury heritage (the company was founded over a century ago by business magnate John Jacob Astor IV) and to Hong Kong's history. 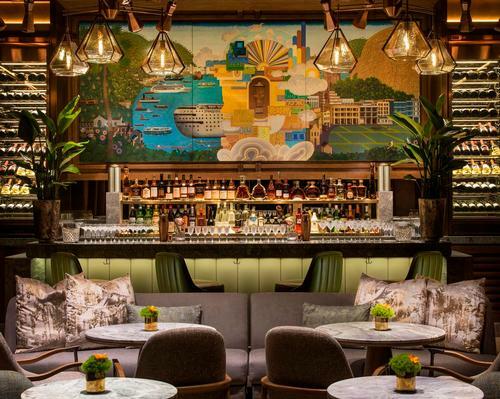 The hotel's main showpiece– a vibrantly coloured, WPA-style mural that hangs behind the bar – illustrates the city's international legacy as a nucleus of trade and commerce. "The hotel's incredible architecture and design beautifully capture the energy of Hong Kong," commented Lisa Holladay, Global Brand Leader for St. Regis Hotels and Resorts. "My design philosophy," explained André Fu, principal and founder at AFSO on his company page, "is about provoking new ways of thinking about what luxury means."